In crowded urban areas, cars aren’t the most efficient way to move people. That’s the lesson from Toronto’s one year King Street “pilot,” which prohibited through car traffic on the high-ridership streetcar corridor. 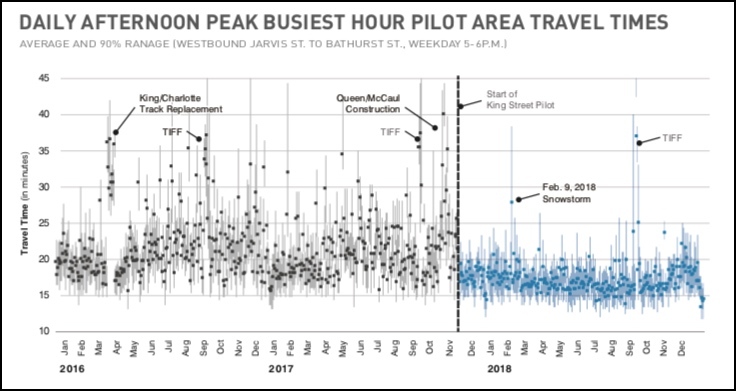 New data from the one-year pilot experiment shows the King Street corridor is moving more people than it did before the city cleared cars out to the way. That’s because removing car traffic from King Street improved streetcar service so much, ridership has grown 16 percent. A total of about 84,000 people are using the King Street Streetcar along the east-west corridor daily, the city reports. But only 72,000 people were using the roadway before the street was redesigned to prioritize the streetcar. The data comes from new report from the city’s transportation staff recommending the corridor design be made permanent. The city estimates it will cost just $1.5 million to make the improvements permanent, providing a dedicated lane for existing high-capacity surface transit one of the best transit investments available to cities. Not only is the streetcar moving more people, thanks to its dedicated lane, riders are happier with service as well. The King Street Pilot resulted in about 30,000 minutes saved by riders daily, the city reports. It was especially effective reducing major delays. The slowest average journeys — at the evening rush hour — decreased by five minutes. Drivers haven’t been duly inconvenienced, the data show. Car travel times on parallel corridors is roughly the same as before the pilot began in January, 2017. The pilot did show that retail sales were down very slightly, about 0.8 percent, most notably from restaurants. But the city says that reflects a trend that was underway before the pilot. There were a number of very outspoken business owners that opposed the pilot. But, overall, at least according to the city’s data, the experiment does not appear to have been the retail apocalypse some predicted and was very positive for tens of thousands of daily streetcar riders. But it shows that there are many low-hanging fruit to make transit more efficient. Just give transit the priorities it deserves. Toronto has a great streetcar network that is worth billions and has had billions invested in it, and those streetcars are a big reason why Parking Madness Infill these year features some strong Hogtown contenders. But the city has been very, very slow to acknowledge that it is now the 21st century and we aren’t all on our way to work at the munitions plant like it’s 1940. Four years of Rob F’ing Ford didn’t help either in poisoning the low-information populace against surface transport. But things are slooooowly changing. The new streetcars are huge and from their size alone necessitated eliminating some of the too-tightly spaced stops (more need to be cut). Payment is now entirely POP (although the onboard machines are impractical to use when crowded, more curbside machines are needed). Signal prioritization is now in place and many turns removed but more needs to be done to make the ROW for streetcars only. There is just no logic in a situation like this for allowing a few cars to slow critical transit infrastructure. The pilot has worked well, keep going T.O. Now if only the TTC could get more non-farebox funding (highest monthly pass cost in North America)…. maybe a little NYC style congestion pricing? By giving a streetcar its own lane makes the streetcar light rail. This is a lesson the Europeans learned in the 1930’s and 90 years later, North America is beginning to learn as well. North American streetcar companies understood it well too, but the government didn’t allowed them to restrict traffic in their right of ways. It was one of many government interventions that took down private streetcar. Not quite true – the data showed that the growth was 0.8 percentages points less than the previous year. Retail sales growed, just slower than the previous year. In the three months since car traffic was diverted off King Street, rush hour streetcar ridership has risen 25 percent. By deflecting private car traffic away from King Street, Toronto opened up new possibilities for faster, safer transit design. Toronto Cleared Cars Off a Major Transit Corridor — And it Worked! Once the street was closed to cars, about 20,000 additional streetcar riders materialized practically overnight. Will Toronto Get Cars Out of the Way of the King Street Streetcar? Why Is Seattle Mayor Jenny Durkan Playing Games with Transit? Seattle Mayor may kill a nearly-shovel ready transit project that experts say offers a respectable returns and needed service. Albuquerque, Cleveland, Toronto, St. Paul, Austin and Halifax - each of these six cities claimed a lot of space from cars to make streets work better for people.